DUG Insight User ManualFrequently Asked QuestionsFrequently Asked Questions MiscellaneousHow to download, unzip and load volumes and surveys into Insight? If you have sent us your data for testing and bug fixing (see How to upload to our FTP server? ), we will revert to you once we have identified and solved the problem. A download link to the .zip file containing the usable data will be sent to you. Follow the steps below to download, unzip and load the data in Insight. Note: We understand that the contents of any data sent to us are confidential and intended for testing and bug fixing purposes only. Under no circumstances will the data be shared or distributed to anyone other than those necessary to solve your problem. You have our promise that we will safeguard your data to the best of our ability. Once we have solved the problem and closed the support ticket, your data will be removed from our system. Download the .zip file as provided by DUG's support team. When the download is completed, locate the .zip file from the download folder. Double click and extract the contents using WinZip or any similar software. If you have been sent a volume, the .zip file should contain a folder with the .dugio extension. Copy or extract the folder into your project directory's 100sei folder. If you have been sent a survey, the .zip file should contain a file with the .survey extension. Copy or extract the file into your project directory folder. Note: You can choose a different location for the survey file. However, we generally recommend placing it in the project directory for convenience. From Insight's Control Panel, click on the Import menu and select Surveys. Navigate to the location you copied the survey file and click Open to import. The survey will now be loaded in Insight. Note: You must add a survey before adding any volumes. To load the volume, click on the Import menu and select Volumes. Navigate to the .dugio volume you downloaded and click Open to import. The volume will now be loaded in Insight. 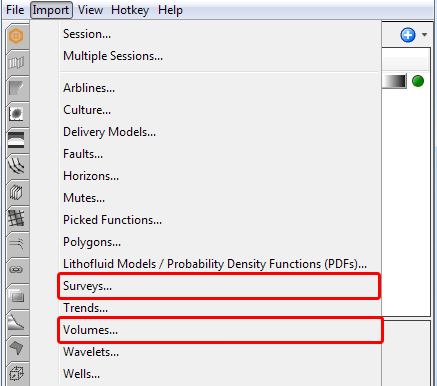 Click on the View menu and select any section view to display the volume on the survey. Prev: How to upload to our FTP server?